This photo is misleading. First of all, the bacterium Bacillus thuringiensis (Bt) is not toxic to humans, or animals, or even many insects. Bt toxin is particularly toxic to Butterfly and Moth type insects…the REAL problem with Monsanto GMOs is they are unnatural mutations that were never meant to exist in nature. Having a plant enabled to produce a bacteria that is meant to protect it from a ‘pest’ that feeds upon it will…not can, but WILL…create super bugs that are not affected by Bt. Which will really tick me off, because that is the only organic way I have found to successfully control cabbage worms, besides netting, and netting is not always possible or practical. Also, as with any intervention, should be used ONLY when necessary…which is around one month out of the year where I live. GM corn fed live stock have definitely shown signs of disease of internal organs compared to the same breed/species fed organic corn…but this is not because of the Bt toxin. It’s not even because of the GM corn. I believe it’s because Monsanto GM crops are “Round-Up Ready” meaning they can be, and therefore, are SOAKED in the herbicide Roundup. According to an article I read at Scientific America’s website: “Weed-Whacking Herbicide Proves Deadly to Human Cells”, which can be read here: http://www.scientificamerican.com/article.cfm?id=weed-whacking-herbicide-p, it’s not the glyphosate which is the active ingredient in the herbicide, it was one of the inert ingredients, specifically the surfactant polyethoxylated tallow amine (POEA), that is toxic to humans…and other wild life including tadpoles. The article says Monsanto claims that Roundup has sold since the 1970s. I know Wikipedia isn’t necessarily the be all end all for factual information…but according to the article I read there: (http://en.wikipedia.org/wiki/Roundup_%28herbicide%29), Monsanto patented the active ingredient in 1970, and Roundup was put on the market in 1976 (so says the “Manufacturing Status” Under the Roundup logo in the cell to the right of the article)…however, the body of the article states Monsanto began marketing the product in 1973. Regardless of the actual year that Roundup was first used on our food crops, and lawns…I am certain that it began sometime in the 70s and its use has increased each and every year since. Monsanto held the patent until it’s expiration in 2000, and then the herbicide began to be produced by all other manufactures inclined to do so. And no doubt this has done more to increase its use. I found this at http://www.nature.com/news/2011/111102/full/479022a/box/1.html, who sites the source for the image as Autism Speaks. I could not quickly find this at Autism Speaks.org, but I did find that “Autism now affects 1 in 88 children and 1 in 54 boys” (http://www.autismspeaks.org/what-autism/facts-about-autism). I know several people who have children that suffer from some form of autism, some of these people are personal friends. Incidentally I have taken an interest in the malady and have been looking for an environmental factor that changed sometime in the 70s. 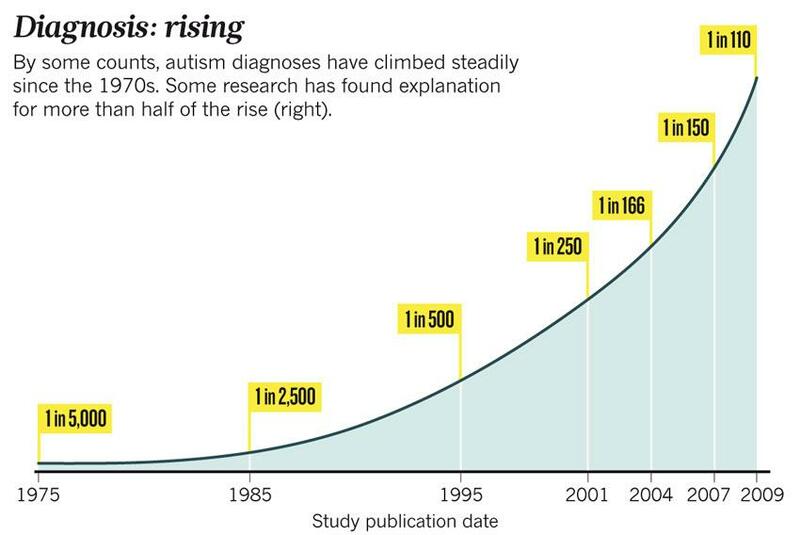 According to a California Study (http://www.sciencedaily.com/releases/2008/01/080107181551.htm), eliminating thimerosal from most vaccines did not reduce the reported cases of autism…they, in fact, continued to rise…so if it’s not the thimerosal in the vaccines that is to blame, then what is…what has changed since the 70s? Graph created by Divinia “doodle” Featherly with data from the sources noted in the image. 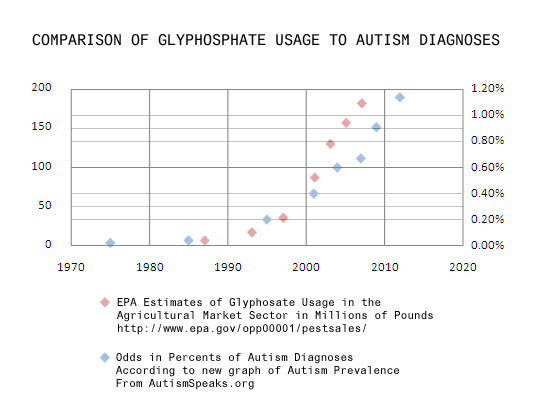 I cannot say that Roundup is responsible for the rise of autism…but I would be really interested to see what would happen to the number of reported cases of autism if the world quit using herbicides containing POEA. 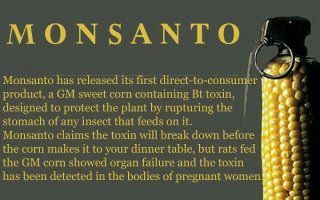 Monsanto is, in my humble opinion, evil. Monsanto and the FDA are so in bed with each other that the affiliation has gone far past being comparable to the fox guarding the hen house…and mutated into something more like the police running, and working the meth lab. Monsanto has won court cases for patent infringement against innocent farmers whose non-GMO crops have been raped by the pollen from a neighboring farm that used Monsanto’s freak seed…and I’m sure this is just the tip of the ice burg of the evil that is Monsanto. Like so many things evil, so many negative facts can be reported to bring to light just how black they are. However, care must be taken to not report misinformation. Misinformation creates noise that dilutes and detracts from the truth that needs to be presented to the public.